Everyone likes staying at a good hotel: the tasty food, the freshly made beds, the perfectly regulated air temperature. But what about actually working at one? If you're the kind of job seeker who loves to help people but hates working in a cubicle, a career in hospitality might be just the ticket. After all, someone's got to make sure those thermostats are properly balanced!Today we've collected ten of the best jobs in the hotel business, all currently hiring. From valets and concierges on up through managers and senior accountants, they run the gamut of duties and experience. Click through to check them out. Description: Provide day-to-day leadership and direction by maximizing financial returns, driving development of people, creating and maintaining a unique guest experience, executing on brand standards and building awareness of hotel and brand in the local community. Description: We are seeking an Assistant Executive Housekeeper for the Edisto Island area. Up to 2 years of extensive hands-on experience in the housekeeping profession, with responsibility for 5 or more people; willingness to assist housekeepers as needed; understand budgets & financial statements; excellent problem solving skills; strong ability to grow & learn; bi-lingual Spanish/English a plus. Description: The Lead Valet Parking Attendant orchestrates the service experience for patients and visitors while working alongside coworkers to ensure the site’s service standards are met or exceeded. Under the direction of the Account Manager, the Lead Valet Parking Attendant has additional duties involving coordination and administration, as well as providing troubleshooting and/or guidance when the manager is not on-site. The Lead Valet Parking Attendant is not a manager; however they may handle critical issues and may be required to make judgment calls when expediency is priority. Description: Efficiently assists Executive Chef to manager within pre-established food and labor cost controls and plays an active role in contributing to the restaurant’s profits. Maintains operational control of purchasing, receiving, purveyor lists and inventory of all kitchen items when Executive Chef is not present. Menu creation, recipe development, enhancing knife skills and teamwork. Monitor overtime and ensure staff motivation. Oversee product consistency and make necessary modifications according to business needs. Monitor waste and over production, as well as utilize leftovers and ensure proper rotation and quality control. Description: The ideal candidate will be responsible for all accounting functions for several hotels within the JRK Hotel Group. These responsibilities include maintenance and supporting the general ledger, maintenance, accounting and collection of accounts receivable, supervising accounts payable, occupancy tax return preparation, income audits, monthly financial reporting including financial statement preparation, budgeting and forecasting and profit and loss analysis. This position will supervise at least one accounts payable/staff position and will report to the Controller of the Hotel Group. Description: Display knowledge of and adherence to land management rules as described in contracts. Manage and care for equipment and assist with proper maintenance of vehicles.Complete all paperwork accurately and in a timely manner.Learn Red Mountain programming and provide this information to guests.Attend and remain up to date on all required Red Mountain training.Demonstrate proficiency in Red Mountain Gold Star Standards. Description: Do you enjoy working by the water? Are you looking for a dynamic and growing organization that will both challenge and reward you? Join our team at Sun Communities and embark on an exciting new opportunity! We are looking for a Pool Attendant to maintain a clean and sanitary pool area and ensure that all safety equipment is present at and around the pool area at all times. Description: Deal live poker games and poker tournaments. Proactively greet, interact, and assist staff in a professional manner to foster and promote a cooperative and harmonious work environment. Maintain a professional, friendly and courteous atmosphere that provides guests with an exceptional gaming experience and ensures efficient operations. Must have the ability to handle money and perform basic math. Maintain the integrity of the game by remaining attentive and monitoring the moves of all players. Understand the rules and procedures of all poker games offered. Maintain the accuracy of all financial transactions by ensuring the correct exchange of currency and chips, as well as, balancing the banks at the end of each shift. Description: This exciting position develops catering business and executes tactical sales plans strategy. You will prospect and qualify new business and negotiate guest room rates, meeting room rental, function space, and/or hotel services within approved booking guidelines, and produce and/or review all sales contracts, rate agreements, and/or banquet/catering event orders. 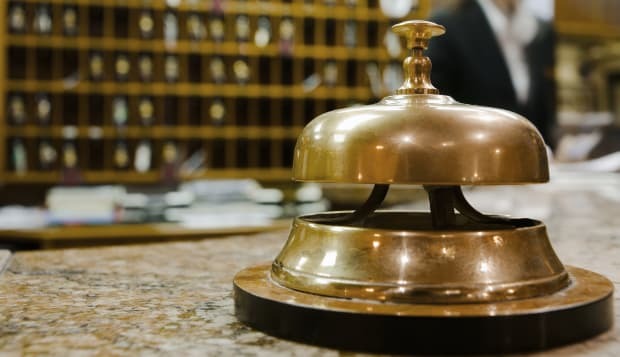 The role works closely with other hotel departments to facilitate services agreed upon by the sales office and prospective clients and produces monthly sales-related reports and sales forecasts for assigned area of responsibility. Description: Greet tenants as they enter the building. Monitor and authorize entrance of visitors and delivery drivers. Accept packages and deliveries on behalf of tenants. Answer telephone calls to take messages, answer questions, and provide information. Communicate with tenants’ information regarding the community such as events in the area, good restaurants, directions, etc. Call police or fire departments in cases of emergency, such as fire or presence of unauthorized persons.